It shouldn’t be that hard of a question to answer: Who’s filing Freedom of Information requests in Nova Scotia and what departments are receiving those submissions? The good news is the government does compile that data in an annual statistical report. The bad news is the last report published is for 2012. The province says it identified “greater difficulties and discrepancies” while reviewing 2013’s numbers. “Staff are reviewing all of the data that was submitted to ensure its accuracy and making changes as necessary,” writes spokesperson Kevin Finch. The report is supposed to offer an annual summary of statistics related to Freedom of Information requests sent to provincial departments, agencies, school boards and commissions. It also covers municipalities, universities, police and health authorities (which are all FOIPOP-able). The annual report for 2012 was published in December, 2013. Finch says the review of 2013’s numbers happened this February. 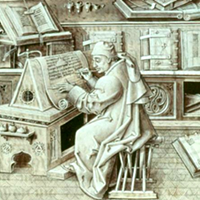 "The system is antiquated and cumbersome, rigid in its design and it is difficult to produce accurate reports." But Finch won’t say which numbers, which tables or which “entities outside the provincial government” are responsible for the shoddy bookkeeping. According to 2012’s report, FOIPOP requests have almost doubled over the last five years (1,377 in 2008 versus 2,669 in 2012). In addition, a total of 2,757 Routine Access requests were made in 2012 (a simpler process for getting regularly published information). The report itself is embedded below this post. It might all seem trivial, but knowing who’s requesting info and where they’re requesting it from does help to understand the provincial conversation. It shows what priorities we focus on, and what corners are being left unexamined. Environment was the most heavily-accessed provincial department in 2012, with 434 separate requests. It was followed by Community Services with 249, and Labour and Advanced Education with 73. The departments of Acadian Affairs, Archives & Records Management, Emergency Management, Immigration, Seniors, the Human Rights Commission and the Chief Information and Treasury Board offices all received zero FOIPOP requests in 2012. The Halifax Regional School Board had the most scholastic applications with 11. Six applications were made to Dalhousie University, four to Mount Saint Vincent, three to Saint Mary’s and two to the Nova Scotia College of Art and Design. For municipalities and towns, HRM received 171 of the 199 Freedom of Information requests. All of these numbers only include cases where decisions were reached on the applications. Any 2012 FOIPOP requests that carried forward, were abandoned, withdrawn or transferred in full aren’t included. Nova Scotia’s Freedom of Information office is currently wading through a five-year backlog of files. Back in September, newly-appointed review officer Catherine Tully said it would take “more than a year” to get through the 235 unprocessed files. That accumulation hasn’t affected the statistical report’s delay, and vice versa, says Kevin Finch. As The Coast has previously written, Nova Scotia’s Freedom of Information act remains frustratingly inadequate. 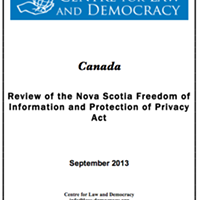 A 2013 report by the Centre for Law and Democracy ranked Nova Scotia’s legislation seventh out of the 14 freedom of information laws in Canada. Major problems include the many exemptions departments now routinely use to redact information, flimsy protections for public interests and the review officer’s backlogged case files. Kevin Finch says the province hopes to deliver 2013’s statistical report soon, but can’t offer any specific date. Looking forward, he says Nova Scotia is considering format changes to make year-to-year comparisons more consistent. Countries better than us include India, Russia, Newfoundland. And other findings from the FOIPOP review officer’s report. Liberals and PCs "unequivocally" agree to the recommendations from the Centre for Law and Democracy.